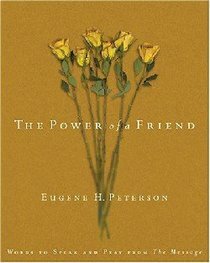 The Power of a Friend highlights essential biblical passages on friendship in the easy-to-read language of The Message. - Publisher Expanding on the popularity of "The Power of a Blessing," these are books women can open up any time, any place, to any page and find an encouraging message from the Bible. Features the modern, easy-to-read language of "The Message." About "The Power of a Friend"
Expanding on the popularity of "The Power of a Blessing," these are books women can open up any time, any place, to any page and find an encouraging message from the Bible. Features the modern, easy-to-read language of "The Message."